Harvey Meline: Are you enjoying the dance, Joan? A crooked banker, tired of having Bob Steele thwart his repeated attempts to steal from his own bank and angry that Steele stole the girl he was interested in, frames him and has him thrown in prison. Bob gets a very quick parole though (The phrase, "revolving door" comes to mind. ), coming back to straighten things out, once and for all. Paroled - To Die (great title) isn't as atmospheric as other Republic B-westerns and has a few lapses in logic. 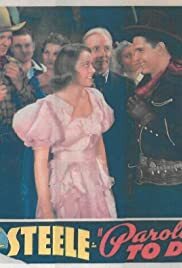 However, it's fast-paced enough and Bob Steele, one of the most atypical in looks and mannerisms of all the Saturday matinée western stars, is always a lot of fun to watch. Some of the best scenes involve Steele's crashing of the town dance and his cat-and-mouse games with the bad guys, in the hills outside of town.